I have to confess that I did not have such a big socket to undo the oil filter cap and tried various other possibilities without success. Mine was on quite tight. I gave up and ordered a 27mm deep socket through Amazon. My Partner Combi has a sump guard underneath. It is not necessary to remove this as there is an access hole in it for the sump plug. If you are facing the car, it is on the left of the sump guard just between the wheels. The plug is at the bottom of the sump so the oil comes out vertically. This is a distinct advantage over other vehicles I have had where the sump plug is at an angle on a corner. The oil spurts out at an angle and then, as flow decreases, it then falls vertically. This makes it difficult to position a container to catch all the oil. With the Partner, it is easier to set up a container to catch the oil. I am not going to give any more advice on changing the oil, as I am clearly not an expert at it. I always seem to end up with a right mess with the used oil going everywhere. First, remove the air intake on the right of the engine. 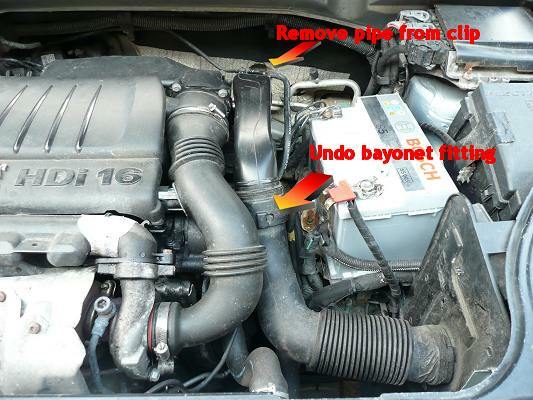 Undo the bayonet fitting shown, unclip the pipe at the back and pull out the intake duct. Then remove the air outlet duct to the turbo. Slacken the large Jubilee clips at either end. Unclip the sensor half way down and pull off at either end. Take away this duct. In the front of the engine to the right, you can now see the oil filter cap with its hexagonal protrusion. As mentioned above, the best way to remove it is with a 27mm deep socket. Unscrew it anticlockwise. As the oil filter comes out, the oil will drain away down into the sump. 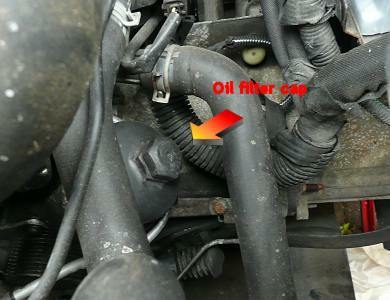 Remove the cap and filter, catching any oil on paper towel. The filter should be pulled off the cap. It will not be easy but persevere with twisting and pulling and it will come off..
Return to the engine and clean out the filter bowl as much as possible. Also clean out the fuel filter cap. Note the drain hole (at 5 o' clock in this picture). It is important that the short tube at the base of the filter goes into this hole when it is replaced. Push the new filter onto the spigot in the filter cap and ensure it goes fully home. Remove the old sealing ring for the cap as shown and replace with the new one which should have come with the new filter. Put the filter and cap into the filter bowl in the engine, ensuring that the short pipe at the base of the filter goes into the drain hole. Screw the cap down and tighten with your 27mm socket. Replace the air outlet tube to the turbo, ensuring that the sensor goes back in place and the two Jubilee clips at either end are tightened. Then replace the air inlet tube ensuring that the bayonet connection is correctly in place. Reclip the small tube at the back of this component. Clean up around the sump plug hole and replace the sump plug. Fill the car with oil (about 4 L). Run the engine for a short while and then recheck the oil level. It is probably a good idea to take it for a test drive and then, at the end of the drive, recheck the oil level and check for oil leaks. If you want to reset the service indicator, I can recommend an article on the topic on the website www.peugeotdiesel.com. It is not that difficult.